You are here : Home / Internet Offer / Internet Package / Recharge offer / Teletalk / Teletalk 1GB Internet 99 TK Offer 2017. 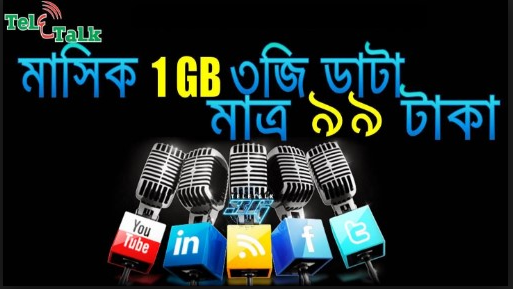 Welcome to Teletalk 1GB Internet 99 TK Offer 2017. All the Teletalk Prepaid and Postpaid connection users this offer . 30 days Validity . 1GB Internet Package 99 TK Offer 2017. If you are a Teletalk Internet Users to uses internet first check the Teletalk 1GB 99 TK Internet Offer 2017 details information. prepaid customer need to type “D60” then send 111.
postpaid customers need to type “F25” then send 111. Dial Direct USSD Code *111*530#. The validity is 30 Days..
To check remaining internet balance of Teletalk 1 GB 30 days Validity Offer, just Dial *152#. Teletalk Internet Package 1GB both 2G/3G area networks. This offer uses times 24 hours.